Food, Culture, Outdoor Adventures and Travel along America's Atlantic and Pacific shores and the Great Lakes! Just as Norman Maclean, the author, was haunted by rivers, I am haunted by pizza. Ever since my father brought home a steel-mill sized eight cut from Santora’s Pizzeria in the Kenmore neighborhood of Buffalo, New York, fifty years ago, I have been a pizza aficionado. No matter whether I am on the East Coast, West Coast, North Coast - - or even in Europe, I will try the pizza. Of all the pizza on all the coasts, I like New York City pizza the best, so far. With so many pizzerias and pizza types, there are probably pizza rivalries as intense as gang rivalries. Think of a Martin Scorsese movie called The Slices of New York. In some parts of the world, pizza toppings are essential to compensate for weak pizza fundamentals, such as the crust, cheese or sauce. The City is noteworthy because has so many places where the pizza fundamentals are so strong that no toppings other than cheese are required. I hope pizzeria owners will take this as a compliment, even if they lose the price of some extra toppings. 1. 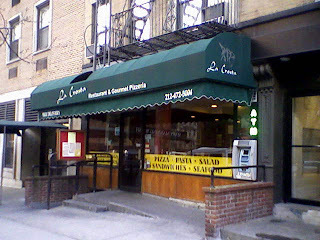 La Crosta: This pizzeria is on Manhattan’s Upper East Side. La Crosta’s generous sized slices have a pizza crust that is particularly good; it is light and airy, yet strong enough to carry a generous combination of sauce and cheese. 2. Deninos Pizzeria and Tavern: The first several times I visited this Staten Island pizzeria, I burnt my mouth on the hot smooth cheese and the great sauce. After a few blisters, I learned to pause with a soda or beer first. If you eat in, check out the pool table and great jukebox. 3. Rosa’s: There is a Rosa’s in Penn Station and in Queens, each with different owners. The Penn Station Rosa’s, on the Long Island Railroad side of the station, has generous sized slices which have great cheese and sauce and a strong crust. Wonderfully cold beer is available as well. I have not been to the Queens Rosa’s, but fellow bloggers rate it highly. 4. Joe and Pat’s Pizzeria: The home of the first New York pizza I ever had, Joe and Pat’s has a magical oven that cooks pizza like a wood-fired oven - - but for 40 years before the wood-fired pizza appeared. Crust is crispy on the outside but soft and chewy inside, like the best Italian bread. This place uses chunk mozzarella, instead of shredded. It's so good that my sister and her fiance often detour off the expressway for an eight cut on the way to see my mother - - I’d do the same if Joe and Pat’s was on my way to my mother’s. 5. Sbarro in Times Square: Why, you ask is a chain mentioned with such distinguished local places. Well, Sbarro’s pizza’s crust, cheese and sauce may not be as unique as the places listed above, but they are reliable and tasty. The Time Square branch has the added advantage of being convenient for someone craving a pizza in Midtown when other places are closed. One last pizza pick, for people who live to the east of the City, is Prima Stella, a few exits to the west of Riverhead. I like Prima Stella’s pizza as the chef brings the crust, cheese and sauce together in an appealing manner. Stella has congenial staff and is has convenient hours, if you are coming or going from Long Island later in the day or night. Note: I will be adding contact information for these eateries over the next few days. But if you need the info sooner, please leave a post!